The MC was the best one yet out of all reverse harems in my opinion. She is strong and even in hard situations she is able to pull through without seeming weak or needing of protection. The characters are also all very good-looking. Love the design and animation. I feel that the overall plot for this was rushed quite significantly. It seemed as if all the major events happen in the last three episodes, which is kind of a bummer. I like the plot overall, but I wish there were more episodes to create a more fulfilling ending. Sometimes this anime gets a bit cheesy, which makes me cringe, but it is hilarious all at the same time. I would still recommend people to watch, it's a fun anime. If you like things like otome games this is for you the typical everyday harem. They always have a terrible female character who are usually weak and shy and always end up being with cute looking male characters. The story is usually weak as well or drags on for like 12 episodes. Welp I might be better off watching the sucky chinese anime. But now I'm just sad. That may make it sound like a bad thing, but it's not. Don't come in having expectations for anything else. If you are only looking for good music, random drama for the sake of drama, and a reverse harem where the girl could literally not be in the story and it could continue going fine, then this is the story for you! An Awesome Male Idol Anime from T.M. Revolution! almost ruined the series for me. His name is Yashamaru and he's a androgynous man who works with Gandala Records. He was okay until the 12th and final episode where he turns out to be an unlikable prick who is so evil that he even is possessed by a literal Japanese demon! In the same episode, Yashamaru wants B-Project to sign a contract that keeps them from achieving their dream to sing during the New Years Eve Concert at the Tokyo Dome! However, I'm glad that the final episode ended on a high note because it almost made me want to hate the entire series. his white haired band-mate once fell in love with him meaning that they are secretly gay for each other. Last but not least, the animation and music are well done. The 3-D and 2-D mix well together unlike in other idol anime and the songs that the various groups of B-Project sing are amazing and what would you expect from being produced by none other than Takanori "T.M. Revolution" Nishikawa, a man with such a huge talent! 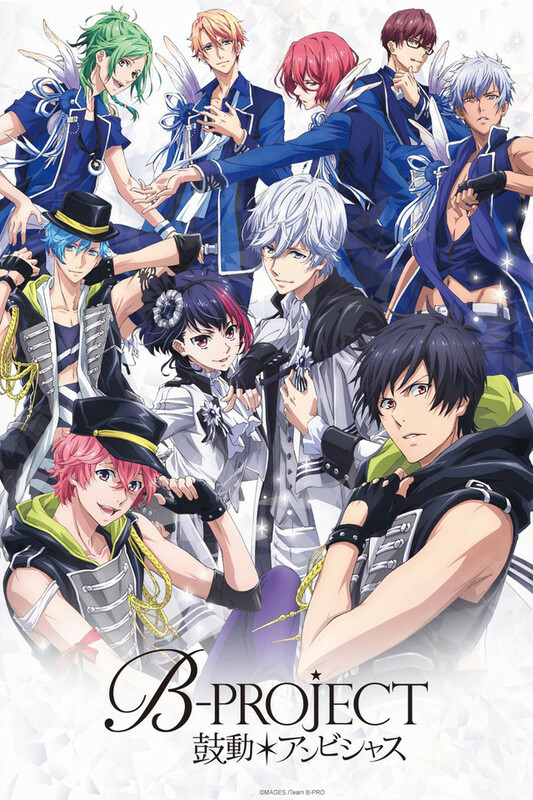 Overall, you should definitely check out B-Project. It is unlike any idol anime before it in a good way and I'm so surprised it hasn't been picked up for a second season yet! Overall I though it was great! If you like Uta no prince-sama then you'll like this, but... I felt that there was a lot of information or just stuff that was missing. Like they need to elaborate little more on Yashamaru, Sakutarou and Sumisora, Tsubasa rocky relationship. I dont know, I just feel a lot was missing. Loved it, but I get the lack of hype. I really enjoyed this anime, but I can see why it isn't everyone's cup of tea. The story is not completely horrible, but I have to admit I fangirled through most of it. The main character isn't bad, but isn't always involved, which I actually didn't mind. I liked the fact that she was not the only one getting attention in this group, it was pretty different from what I was originally expecting. She also did not take away from the anime how some main characters do in harems and reverse harems which can be kinda annoying. I would say it is an overall alright anime, but it is lacking a bit.... Although I still really love this anime. I loved this anime, I don't know why it has such poor ratings. It's actually pretty good in my opinion. It might not be for some people, but it is for some and that's me! I loved the characters, but only thing is at the end it felt a little rushed. That's all I will say about that! It was good for a reverse-harem okay!! I really enjoy this show! I so wish to be that girl, she has the life! It's far more intense then you would think. It's about an idol group made of ten boys, and a female A&R. The ten boys are very pretty and all eye candy! It can be very touching, but also very funny! Get ready for singing and music! After all, it is about Idols! The story is more then what I expected and had far more drama then I would think. This show is one of my top shows I really did enjoy it!